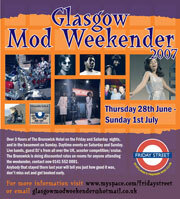 The first details of this year’s Glasgow Mod Weekender are now online. It all takes places from Thursday 28th June to Sunday 1st July at Glasgow’s Brunswick hotel, with the usual top-notch DJ line-up, bands, daytime events and scooter cruise. Check out the listing in the events section for more details, along with details of discounted accomodation if you want to stay at the Brunswick Hotel itself.